Links between nations are eroding, and divisions in society are becoming ever wider. 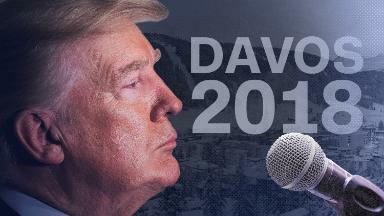 As world leaders, including President Trump, gather at the World Economic Forum in Davos this month to discuss how to create "a shared future in a fractured world," CNNMoney takes a look at some of the major forces that are driving countries and people apart. Most people live in countries where income inequality is growing. The rich are getting richer and the poor are getting left behind. Wages at the top are rising faster than those at the bottom. It’s not just salaries. Wealth amassed over a lifetime is even more unevenly distributed than income. That’s because much of it is held in property, stocks, and pensions – assets that can yield high returns, but are out of reach for many. For example, wages paid to workers in Germany increased by 5% between 2000 and 2016, while income from investments and business activities jumped by 30%. All is not lost. Researchers from the World Wealth and Income Database project say that while inequality has been rising in almost all countries, it has been growing at different rates, which suggests governments can do something about it. Research from the International Monetary Fund and others has shown that inequality damages economic growth and makes everyone poorer. Women earn less than men doing the same job in every country, according to the World Economic Forum. That’s despite the fact that gender discrimination is illegal in many countries, including the United States and all 28 EU members. Women also remain an untapped economic resource. Just 50% of women participate in the global workforce, compared to 80% of men. There’s at least one legal obstacle to women working in 90% of countries, according to the World Bank. They face many hidden costs too — from the $18,000 the average American woman spends on menstruation sanitary products over her lifetime, to the “pink tax” which makes products promoted to women more expensive than the exact same items marketed to men. Ending economic inequality between men and women will take 217 years if the current slow rate of progress continues, the forum said. The IMF is urging more action on equality. When women do better, the economy and everyone in it does better too, it says. Its research suggests that getting as many women into work as men could boost GDP by 5% in the U.S., 9% in Japan and 27% in India. Verisk Maplecroft's "Climate Change Vulnerability Index" is based on exposure to climate-related natural disasters and sea-level rise as well as impacts on population patterns, resources, agriculture and conflicts. The index also considers each country’s preparedness and ability to combat climate change. The countries most vulnerable to climate change are among the poorest in the world. This chart shows that even G20 countries are not immune. The IMF has warned that developing countries are facing rising financial threats from climate change. Hurricanes in the Caribbean and Latin America, extreme floods in South Asia, and droughts in East Africa hit some of the poorest nations in their regions in 2017. At the same time, the U.S., the world’s second biggest polluter after China, has withdrawn from the landmark Paris climate accord under President Trump. The UN has warned that climate change is also fueling regional conflicts, which are forcing people to leave their homes. The International Organization for Migration said climate change is causing higher migration both within countries and across borders as people flee extreme weather and rising sea levels. From the U.S. to Europe and Asia, politics is becoming more polarized. Surveys from the Pew Research Center show that Republicans have become more consistently conservative, while Democrats are more consistently liberal. That means they have less common ground on key issues than in the past. In Europe, far right and populist parties are attracting more support in several countries, including Austria, Poland, Hungary and France. An anti-immigration, anti-Muslim party placed third in Germany’s election in September, becoming the first far-right group to enter the national parliament since 1961. Analysts at Eurasia Group have warned about the rise of Islamism, anti-Chinese and anti-other minority sentiment in southern Asia. They said that intensifying nationalism in India also poses risks to stability. More than 60 million children aged six to 11 are out of school, according to Unicef. More than half of them are in Sub-Saharan Africa, and some 27 million live in conflict zones. Education helps to lift people out of poverty and pushes growth rates higher. But access to schools varies massively across the world. Globally, 65% of people aged 25 and over have got at least some secondary education. In Europe and the U.S., the proportion is well above 90%. In Sub-Saharan Africa, the number plunges to below 30%. Alanna Petroff and Charles Riley contributed to this report.